For almost everyone who made the upgrade, Windows 8 proved to be something of a disappointment for one reason or another. Windows 8.1 (or Windows Blue) was released to address many of the issues users had complained about, including reintroducing the ability to boot straight to the desktop. Being able to boot to the desktop rather than the Start screen is something that people have been clamoring for ever since the first preview versions of Windows 8 were unveiled. There have been various third-party tools released as numerous workarounds used to get around the problem, but now it is an option that is built directly into the operating system. You will need to have downloaded and installed the update in order to proceed, but once you have done this, things are very simple. 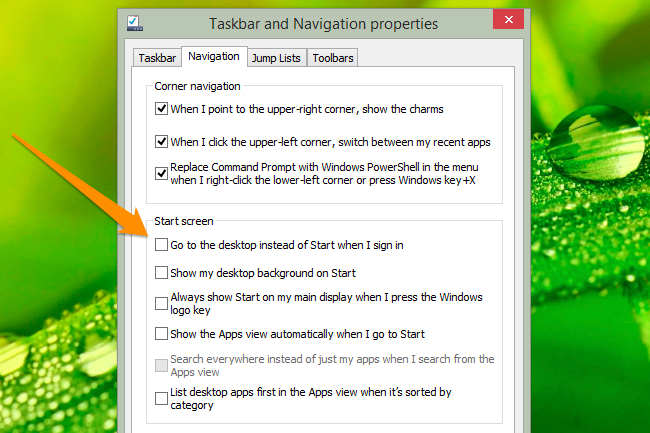 When you have Windows up and running after the upgrade, right click an empty section of the taskbar and select properties to bring up the newly named “Taskbar and Navigation properties” dialog. Move to the Navigation tab and look in the “Start screen” section in the lower half of the dialog. Check the box labeled ‘Go to the desktop instead of Start when I sign in” and click OK.
Once this has been done, you’ll no longer have to take any extra steps or rely on extra software in order to reach the desktop, it will be done automatically so you can get on and do whatever you wanted to do. That’s all there is to it; this very simple setting will have eased some of the annoyance Windows 8 caused for many people.